Overexpression of Parkin reduced SeV-induced activation of the IFN-, ISRE and NF-κB promoters. HeLa cells were co-transfected with the indicated expression plasmids and luciferase reporter constructs driven by promoter of gene encoding IFN-β(A), ISRE (B), or NF-κB (C). pRSV/lacZ was used as an internal control. Twenty-four hours after transfection, cells were infected with Sendai virus(SeV) for 24 h, and then lysed for luciferase assays (upper panel) and immunoblotting assays (lower panels). Anti-Myc magnetic beads kit is based on hydroxyl magnetic beads covalently coupling with high quality mouse IgG1 monoclonal antibody. With high loading of Myc-tagged protein (more than 0.6 mg protein/mL) and high specificity, it is recommended to use for co-immunoprecipitation and protein purification. No signal is observed. 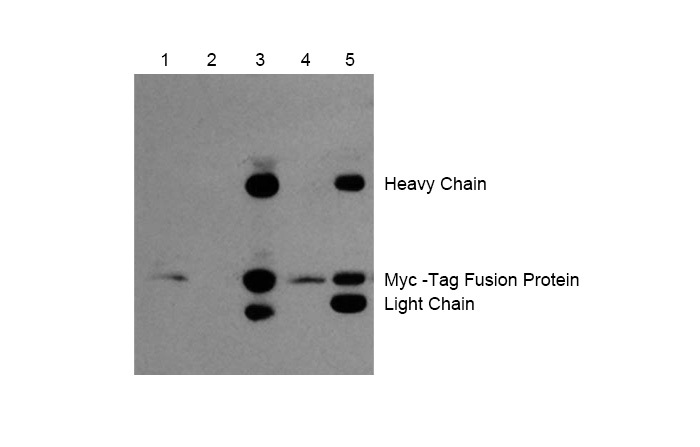 Myc tagged protein is not expressed in the sample. Make sure the protein of interest contains the Myc sequence.